The Bison shirt answers the demand for a lumberjack overshirt without sacrificing safety. Like the Tracer, the Bison is designed as a true overshirt that in this version is waterproof thanks to our incorporated waterproof hydratex® membrane. The polyester canvas is reinforced with our in-house developed PWR|shield at the shoulders and elbows, offering a strong outer shell with a casual look. By incorporating our ultra thin SEESMART™ limb protectors we kept the silhouette tailored so as not to reveal the Bison’s motorcycle-ready character. The overshirt is optionally upgradable with our SEESOFT™ CE-level 2 back protector and to make sure anyone wearing the Bison gets noticed when the sun goes down we installed laminated reflection at the center back. Triple needle stitching ensures a strong connection over the entire overshirt. The inner pocket ensures any documents carried along are behind the waterproof membrane to keep them dry. To keep the heat away on nicer days we installed a ventilation panel at the center back. This new Bison overshirt is another choice for those that want a lighter weight and more simple jacket for riding. 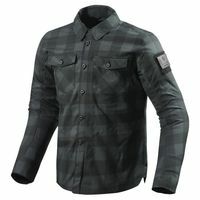 The styling is sharp and has a plaid patter, but don’t think this is a flannel shirt… its actually a very appropriate tough nylon material that will shed water and be tough enough to give abrasion protection in case of a fall. The fit and function of this new Bison is similar to that of the Tracer overshirt introduced earlier this year, but with the plain styling instead of the more military look of the Tracer. And the other main difference is that the Bison is make with a waterproof barrier, so you can find yourself in a shower without getting soaked!